Ludhiyana : Mohan Dai Oswal Cancer Hospital, Ludhiana, has been dis-empanelled by the Chief Minister Parkash Singh Badal from the list of hospitals under the Mukh Mantri Punjab Cancer Rahat Kosh” scheme. This comes after it was revealed that the cancer hospital was asking for money from cancer patients and thus violating the guidelines of the scheme (denying cashless treatment under the guidelines of the scheme). The scheme mandates carrying out free treatment to cancer patients within the listed hospitals that are empanelled by the government of the state under the scheme. The said scheme is fostered as one of the landmark achievements aimed to provide support to patients by the government of Punjab who cannot afford high costs for the treatment. With regards to the concerned hospital,it was found that many patients in the past had complained the government authorities in regard of this discrepancy carried out by the Oswal hospital in Ludhiana, which came to light of late. A written explaination was demanded from the hospital’s end regarding the matter when several complaints were received in the department looking after the scheme as well as during the Chief Minister’s Sangat Darshan. However, after the demand was made by the authorities the reply turned out to be non-satisfactory. “The decision was taken when the reply was not found satisfactory”, government sources informed The tribune report. The Health Minister of the state, Surjit Kumar Jyani said that in total 19 hospitals were empanelled by the state government in order to provide cashless treatment to the cancer patients from the date of diagnostics. However, the hospital in question violated basic norms under the scheme guidelines, which resulted in its removal from the list. 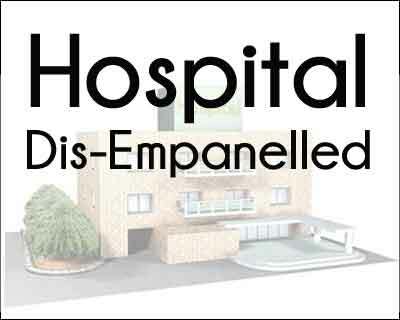 In another recent case in the state, a hospital “Grecian Hospital” was also dis-empanelled from the list of hospitals that come under the scheme for charging money from patients diagnosed with cancer instead of providing them cashless treatment under the scheme.